What a lovely story! In this day and age it is so nice that this older couple can befriend the children from your school. We are taught and must teach our children to be wary of strangers, especially those passing out candy! This is the way neighborhoods used to be and should be! You have taught your daughter the rewards of kindness and caring. Thank you for sharing both the story and the recipe! 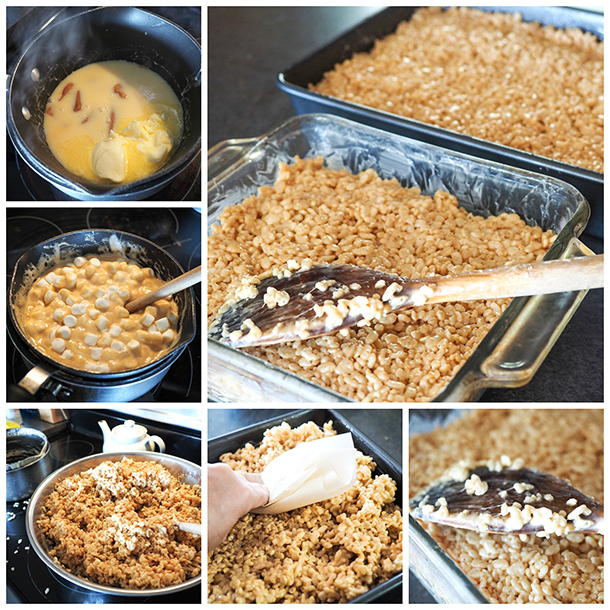 caramel rice krispie treats sound soo good! There gooey creations will adorn my Valentine’s Day table in the shape of hearts and the recipe will go into my “special” cookbook. Great idea, great recipe, and a wonderful activity for children (adult supervision). Thank you for sharing. I just stumbled upon your blog from Pinterest (your awesome printable monster page, thank you!) and took a minute to read this post. What a lovely story, and isn’t that what life is all about? Thank you for sharing.